I'll tell a story about me. I'm a web consumer, I buy lot of things from many different webstores around Europe. I have been quite loayal consumer of Chain Reaction Cycle's, but they lost my loyalty with a thing that wasn't really their fault. I think it's a perfect story of how easy it is to lose a customer in web nowadays. For my triathlon hobby I was looking for aerobars for my bike. As I've used to I headed to CRC to check their offering. And as usual they had really good offering and very competitive prices for aerobars. I selected one set of aerobars and checked from the details view, that clamb diameter 31mm was suitable for my handlebar. I went on and I bought the item. About week later aerobars arrived and I went straight on to try those on my bike. I was bit amazed to notice those didn't fit, those were for 26mm handlebar. I started to investigate why this had happened and noticed that CRC had different information in buy and description sheets of that product. I had actually ordered aerobars for 26mm handlebar by accident. I mailed them to tell what had happened. In couple of hours they mailed me back saying that this was unfortunate, but it my own fault due that information next to buy button had said it to be for 26mm handlebar. I could return the product, but I would need to pay the postage. I do agree that it was part of my fault, but that is not the point in web consuming. Person who was handling my ticket should have noticed that I was a loyal customer. I had ordered within 6 months 953 euros worth of equipment from them in six different orders. He could have said that they are sorry for the mixup and pay the postage back for replacing aerobars to suitable ones. What did happen was that I started to look for other options. I hadn't even looked for options for a long time. Now I started searching and got a really nice deal from another webstore. Just like that they lost one loayal customer. These type webstores are all about small profits and they are trying to cut down costs on every possible place. These kind of webstores are still more than anything else all about cash flow and masses. 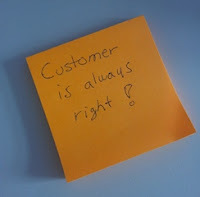 They should do everything possible to keep customers happy. And this was all about 15 euros worth of postage expenses. Not much for me, and nothing for CRC. To note, I have nothing against CRC. I still think it's an exceptional webstore with really good pricing and product catalog. This is just a story of me noticing they are not the only ones. I really like these future prediction films. It's nice to see how view of the future is such a different by different people. In these future prediction films only one thing is for sure, future will never look like that. Still in each of the videos there's always some things that makes sense and could perhaps become true in the future. This video is made out of Electrolux Design lab competion. It's a mixture of home and home electronics for the future. Many of the ideas are quite cool and even bit realistic. Nice to see if any of the ideas will actually fly in coming 20-30 years. 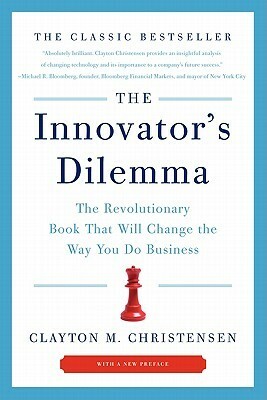 The Innovator's Dilemma has been stated to be business literature classic. Book by Clayton M. Christensen has been quoted in many books I have read and I wanted to know what it is all about. Innovator's Dilemma as a title is bit misleading. Book is really about organizations and technology change and development. In there is the problem called Innovator's Dilemma, but for me at least it was a bit of surprise. I had thought book would tell more about innovation as individuals, but it is all about organizational abilities to adapt to innovation. Book is thorough. It really tells the history of couple of industries and dives in to the root causes of the problems. I appreciate that it is based on facts, but I would have not needed to know those in such a detail level. It is more of a school book than a self learning book. Nevertheless the criticism about writing style and readability, book contents are great. It really explains well why same organizations that prosper in sustaining technologies can't keep up with disruptive technologies. There's lot of excellent and interesting insights that really helps understanding organizations and businesses better. It's a controversial book in that sense. It's a book I'm really happy I did read, but on the other had, it was quite boring to read time to time. I would love that someone would have taken this book to 2010 and written it in more interesting way. This is a must read for anyone making business and organizational decisions in large scale. I bet they all know the book, but somehow the same things happen all the time. New small companies come in and steal the market from the old players. This book explains why. Much too often news websites are designed to be newspaper like. Small pictures are here and there between the text. Layouts of the page are optimized for small screens and don't really use the capabities of the screens nowadays. Cyclingtips is a fresh exception to the too common website layout. They really use big good pictures to fill the screen and the story. 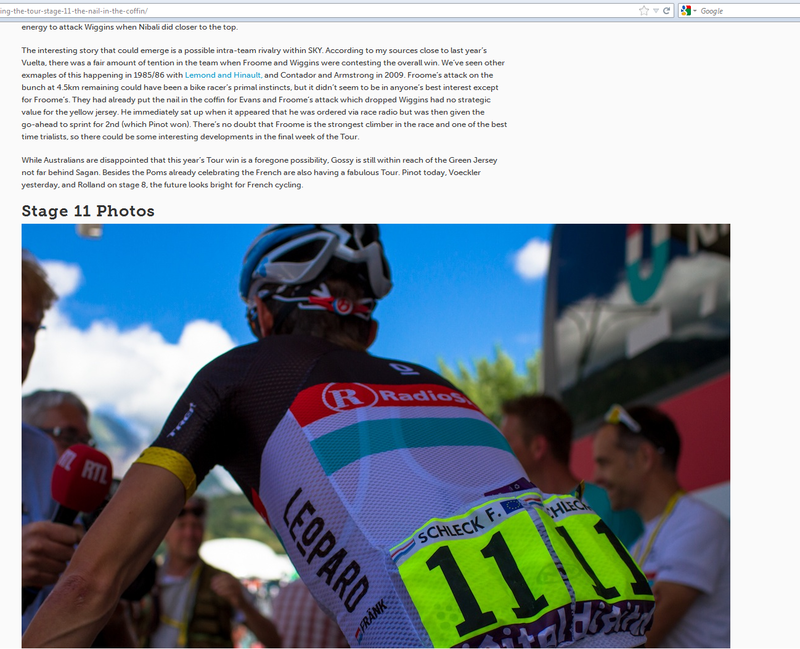 Check for example this article about tour de France's yesterday's stage - Chasing The Tour | Stage 11 – The Nail In the Coffin. Here's a screenshot of their page. Other news websites should learn from this. When people start to scroll they can scroll further. Large good quality pictures really make a difference. I with few others were assigned to arrange team day with quite low budget. It was also stated, that it should be something that wasn't done before. The list of what they had done before, was quite a long one. After brainstorming a bit, we got the idea of a getaway. We would escape from rest of the group and let the others to wonder where and what is going to happen. The we would start giving hints and tips where we are and what we are doing. The idea was that they would start chasing us and after finding we would move together to arranged place to eat and party. We looked for different alternatives how to actually make the idea happen. We realized we need a app with which we could share our location and others could follow. We started to look from Foursquare and other location share apps to find a perfect one, but none of those actually did the trick. Finally one day we hit to an app called Glympse which was a perfect match for our needs. 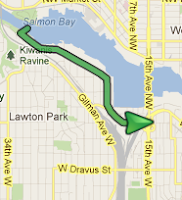 With Glympse we could share our exact location in a map for 10 minutes and then disappear totally. In order to make this hunt even better, we made a blog to blogger, which we the fugitives and the hunters could post photos and text on the fly. This would give a little spice to the hunt. At the scheduled team day, none of the others knew what was going to happen. About an hour before the team was scheduled to start, we the fugitives one by one left the office. Then 14:55, 5 minutes before the team day start, we send a mail to the rest of the group: "Team day has been kidnapped". We stated that we decided to keep the party ourselves and tell you later what it was like. We wanted to give them one change: for the next 2 hours, we will be appearing for 10 minutes via Glympse every 20 minutes. If they could find us within that 2 hours, they could join the party. Idea and execution worked perfectly. We were bit afraid that, would our people actually be playful enough to start chasing us. That worry was unnecessary. First chasers started chasing from our first 14:55 mail,5 minutes before the chase start. We deliberately attached a photo to the first mail, which had a hint of our location. Of course that was a trick from our end to get some of the hunters to leave to wrong direction. That worked out perfectly. The whole thing worked out perfectly. One group of hunters got us quite fast, but some had to use more than an hour to catch us. It was a fun team day and I recommend to try it out. It's a fun way to spend some time outside and playing a real life game.